" After 40 days of fasting, He looked thin, a dried reed in late summer, leaving a meandering trail of footprints along the base of a colossal frozen wave." The desert’s countenance was void of any expression. No mercy for the weak or hate for the proud; its face was as indifferent as death. Even the granite teeth that rose in defiance above the dunes were eventually reduced to dust. Waterless storms whipped across vast empty regions blasting everything in their path. There is no malice driving the sand squall, only a deliberation of the harsh law that rules here; a law that reduces stone to dust and men to bone. Today, there was not a stirring. Chimera heat waves rippled the tanned sand like a phantom ocean. This could be the desert’s most deadly face, the ferocity of the silent sun. No creature could be seen, buried deep to escape the heat. As the sun rose from the east the life-sustaining shade slowly disappeared finding a solitary figure alone, exposed. His face was baked brown, the color of the blistering sand below worn leather sandals. He looked thin, a dried reed in late summer, swaying like a drunk man, leaving a meandering trail of footprints along the base of a colossal frozen wave. Behind his eyes there boiled determination, like a man who had a great destiny to fulfill or a lost madman doomed to the desert’s law. Coming from the far side of the dune walked a completely different sight. Defying the silent sun, he swaggered proudly as if the desert couldn’t touch him. Dressed like a king, long ornate robes lightly touched the sand, making a strange swishing sound. 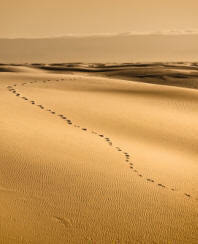 His footprints aimed straight as an arrow toward the faltering man. He towered over the desert man. Jesus looked up at the haughty face of Satan. The testing had come. Fasting for forty days, He was prepared. Behind Satan’s head the sky was strangely empty of angels, only luminous blue reflected the presence of His Father. At that moment, Jesus understood Adam in a fresh way. Flesh is impulsive, His body groaned for food. The opulent presence of Lucifer seemed to punctuate His physical need. The desert appeared to strip Jesus of Deity; He felt as human as any man. Jesus knew the taste of dust, the weakness of human flesh and the gall of Satan’s cunning. He understood the paradox of strength that can arise from weakness. The desert was well made. Within its fires God had forged countless human vessels to house His glory. Fasting is the pilgrimage to the desert of your soul. There, you will meet your greatest foe, and in weakness discover the strength of Jesus. An inspiring read! Thank-you for writing it. Very powerful! It made me realize something about our own wilderness periods, not only the fasting. When we come out of the wilderness, there is a huge anointing. Well, Jesus has the highest calling over all of us, therefore, he went through a wilderness deeper and crueler than any of us could ever understand or endure. And because of that He walked out of His wilderness full of power to literally take on the world! I'm so grateful He bore that for me. His entire walk on this earth was a sacrifice to us. Thank you, my precious Jesus! May we all take the journey!